Pramod Tiwari added that the comment would lead to votes drifting away from the alliance between Mr Yadav's Samajwadi Party and Mayawati's Bahujan Samaj Party (BSP). Mulayam Singh said he hoped PM Modi became prime minister again. Mulayam Singh Yadav's comment in parliament that he hoped Prime Minister Narendra Modi becomes PM again will benefit the Congress, party's leader in Uttar Pradesh, Pramod Tiwari said on Wednesday. He added that the comment would lead to votes drifting away from the alliance between Mr Yadav's Samajwadi Party and Mayawati's Bahujan Samaj Party (BSP). "I do not know in what circumstances he (Mulayam) gave the statement. But, if any party stands to gain politically from the statement, it is certainly going to be the Congress," Mr Tiwari was quoted as saying by news agency PTI. "By his (Mulayam's) comments, his votes are not going to Modi and it is likely that the votes will drift away from SP-BSP alliance," he added. 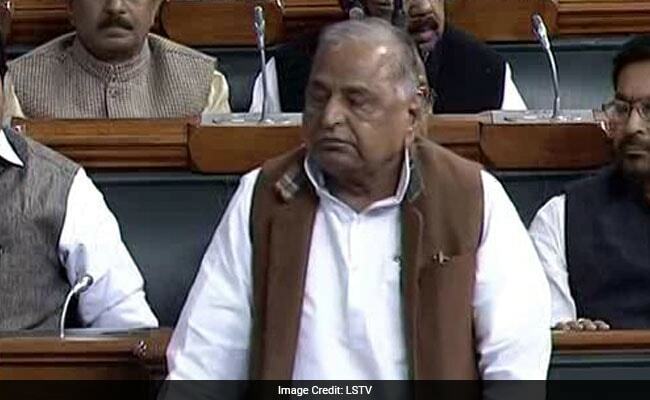 Mulayam Singh Yadav, in a surprising comment, said in Lok Sabha that he hoped PM Modi became prime minister again. The comment was in conflict with his party's line. His party's leaders have not reacted to the comment, which may bring embarrassment to Mulayam Singh Yadav's son Akhilesh Yadav, who has allied with Mayawati to stop the BJP in Uttar Pradesh in the upcoming Lok Sabha elections. "I have not seen what statement he has made. I have no clue," party spokesperson Rajendra Chaudhary told PTI. Congress president Rahul Gandhi, PM's bitter rival, said he disagreed with Mr Yadav's comment but he respected his opinion.